I'm using DoHop to find flights but I notice that some of the best/cheapest flights for me require two bookings. Why are 2 bookings required here? What are the dangers of 2 bookings? If I tell them at the first check-in I have a connecting flight, will they be likely to book me through anyways? Is there any "trick" to do one booking for a similar price? I would prefer to have check-in luggage (though perhaps if answers are negative I can try to get myself a carry-on case). I'm not really worried about the outbound flight since, in the worst case, I have plenty of time to get my luggage, check in again, etc. However, the return flight looks tight for me, assuming I would have to get luggage, change terminals, and check in again. Would they really not check me through from Dublin to Santiago? The answers summarise that, on a double-booking, the airlines have no responsibility in the case of a missed connection due to a delayed flight, nor to check luggage through to the final destination. They offered some useful info but didn't really get to the heart of the matter. In some cases, airlines will, however, check through luggage on separate tickets. Until 2016, Oneworld airlines (BA, Iberia, LATAM, etc.) did guarantee that they would check through luggage on other Oneworld flights with separate tickets assuming at least a 2 hour layover. However, in 2016 they removed that guarantee. This did not mean that airlines stopped doing it overnight, just that they were no longer forced to as part of the alliance agreement. Some airlines in the alliance went back and forward on that policy. It seems, however, that Iberia do not (officially) check through luggage on separate tickets. In general, information is sketchy, however. Try check with your specific airline and whatever alliance they are part of if they have any policy in this regard. I am still, however, completely clueless as to why these flights (all on Oneworld airlines) could not be combined into one booking by the system (or, seemingly, any other system: I tried various including those provided by the airlines themselves). In the end I booked another flight on a competing airline with a similar schedule but for more money. I felt sort of happy to pay extra to avoid this idiocy having wasted enough time trying to understand something that makes no sense to me. The largest risk is that you'll miss your connection. In this case you'll be considered a "no show" and lose your ticket. If it happens on the outbound flight, your return ticket will also be canceled. This can be entirely out of your control, for example the first flight may be delayed. Still, you'll get no compensation from the company that ran late (possibly a small compensation for the delay, certainly not for the consequences). In your case, the return flight is at very high risk. A slight delay, and these happen all the time, and you miss the connection. In many cases there's no way to make one booking, or it will be a different price. You can try kiwi.com - if you book with them they insure you against this problem. I don't know how useful is this coverage, and there's no guarantee they'll offer the price you want. Another option is to spend a day at your intermediate destination. Have a short vacation in Madrid, and you'll surely catch your flight in spite of almost almost all delays. Why two bookings? Because that is how the website works, it pairs up cheap seperate routes to create a bigger round trip. Two bookings often means no checked through bags. It also means no protection for delayed flights, so if the first is late and you miss the second you likely have to buy another ticket for the rescheduled second leg. These cobbed together flights appear cheap initially, but get very expensive if things go south. 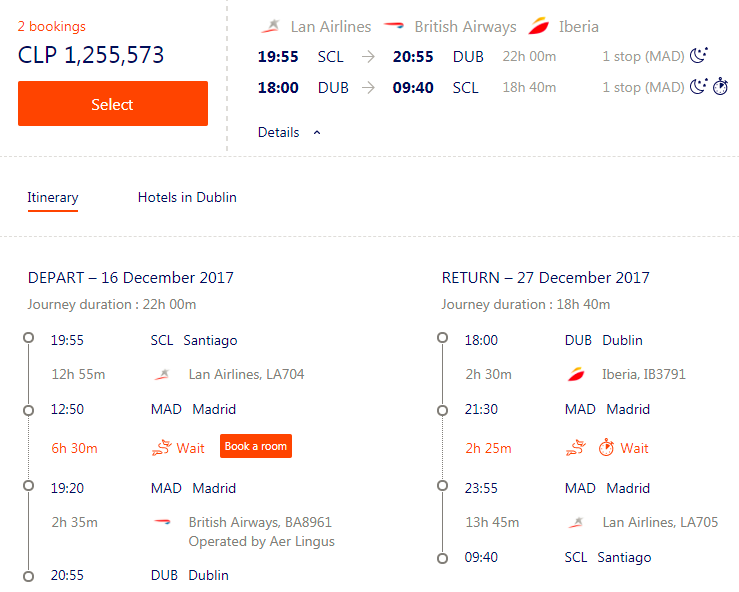 There probably isn't a direct flight between Santiago and Dublin, so you will have to change planes somewhere. It is not really 2 bookings; it is a change of planes in Madrid onto a partner airline. The same happened to me when I flew London to Santiago - had to change planes in Buenos Aires from a BA flight to a LAN flight. And like on my trip, you will probably find yourself checked through to Dublin. You won't have to collect your baggage in Madrid and check in again, just follow the transfer signs, check the screens and show up at the right gate. For the return however, 2:25 sounds quite short to transfer - there's little scope for problems. If you have the possibility to get an earlier flight from Dublin - perhaps an hour earlier - then take that. If not make sure you tell the checking staff about your short transfer time and maybe they will prioritise your disembarkation in Madrid. Incidentally, LAN, BA and Iberia are all part of the same airline partnership, One World I think it is called. As such, they might well operate from the same terminal. You can use the airline's own websites, or the website for Madrid airport to check this kind of thing. Not the answer you're looking for? Browse other questions tagged air-travel bookings flight-search-engines connecting-flights or ask your own question.